Si Scott made his name with baroque combinations of type and image, but his 3D paper insects are taking his work in new directions. ‘My work polarises people, they either love it or hate it. I never wanted to be middle of the road,’ says illustrator Si Scott. In five years of freelancing, Scott attracted a dream team of clients in the ‘love it’ category. 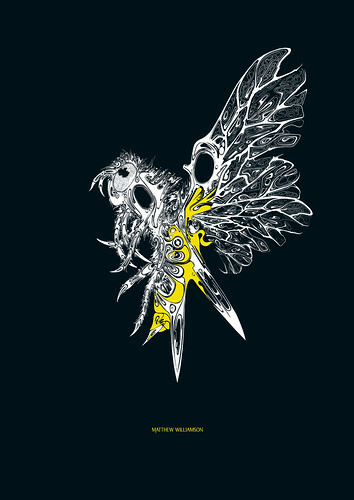 His hand-drawn, sinuously ornamental and achingly detailed black and white type and image combinations graced projects as diverse as a title sequence for the BBC (The Secret of Drawing, 2005), a poster for the Royal Academy (2006), t-shirt designs for Matthew Williamson (2011) and an ad campaign for Adidas (2009). Other clients include Nike, Penguin, Tiffany & Co. and Wallpaper*. T-shirt design (2010) for Matthew Williamson, Spring-Summer 2011. Art direction by Matthew Williamson and Si Scott. 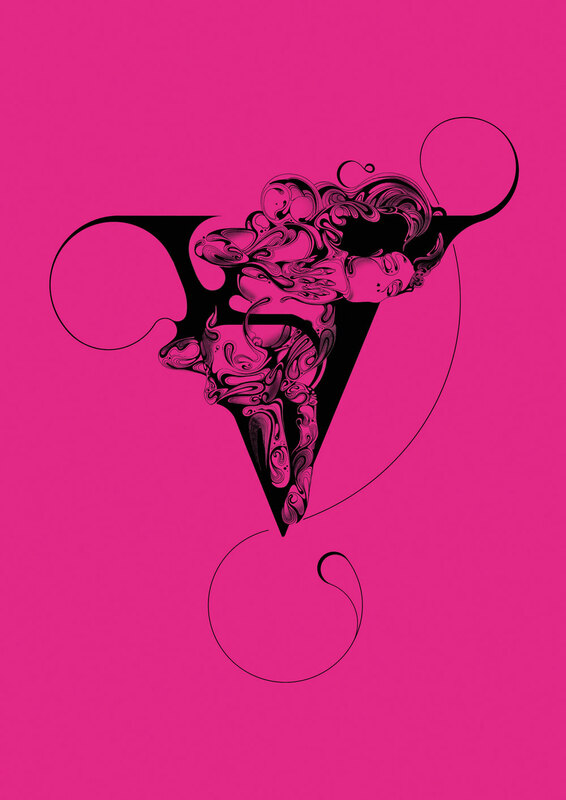 Top: Letter ‘V’, 2009 from the Type Tart Card project conceived by UK Type and published in Wallpaper*, July 2009. 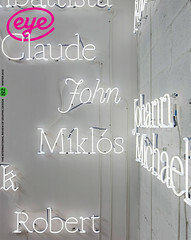 Hence, the breakthrough project for him was type-based: bespoke headline treatments for the music magazine The Wire (2005, see ‘The decriminalisation of ornament’, Eye 58), commissioned by Non-Format (Kjell Ekhorn and Jon Forss). Wire proved to be a high-profile showcase, seen by soon-to-be clients across music, lifestyle and branding. Madonna’s management considered him for an album campaign, but the implication was that if the first lady of pop ‘went with it’, the illustrator could kiss goodbye any ‘ownership’ of that idea forever. So how does he accommodate the back and forth process, from brief to artwork, in commercial jobs? ‘I produce a sketch or a “work in progress” stage, to make sure the direction is right. With big advertising jobs, more often than not, there are strict guidelines and a watertight brief. And even though his style is the product of long hours working alone, commissioned work is always a collaboration. ‘A creative director or art director has their idea of where they want the work to go and you have to respect that. But at the same time they’ve come to you for a reason, so they also need to listen to your ideas. It seemed he had hit on a winning formula. Several of his projects were featured in Creative Review’s 2011 illustration annual, and over his career Scott has won a number of awards, starting off with D&AD’s New Blood in 2003 (by 2011 he was judging). He has also collected two Graphis Gold awards, and featured in ‘best of’ lists in Lürzer’s Archive, Computer Arts and Print. But in late 2010, when decorative, embellished and ornamental were definitely the order of the day, the 34-year-old illustrator decided it was time for change. ‘It’s flattering that people want to copy me, but when clients and friends email me “bad” stuff and ask “Did you do that?”…’ He shakes his head. Scott’s solution to being typecast and copied was to ‘come up with something even more intricate’, demonstrating what Zeegan describes as his ‘unfailing ability to stay ahead of the curve’. He took up a scalpel and began working in three dimensions by cutting and folding paper. With a subdued palette of shades of white, silver and grey, these ‘objects’ are more restrained than his pen-work but retain his signature baroque flourish. Discovering an online source for old museum display cases and insect specimen boxes had inspired Scott to look again at one of his personal projects: the ‘Airborne’ series of ‘re-imagined’ insects he had been working on since 2009. The series has never been exhibited but has garnered much attention via the internet, which led fashion designer Matthew Williamson to commission further images, of insects crafted with pattern-cutters’ scissors. Scott has already parlayed this new approach (with photography by Pantling Studio) into commissions, including a cover for Time Out New York (24 February 2011), a poster for James and a boxed butterfly for the 100 Project, the art education charity of digital agency Poke. See ‘The decriminalisation of ornament’ in Eye 58.